TRIVIA of Noh : Q116 : How did Noh become a ceremonial performance for the Edo Shogunate? | Home | Trivia | Q116 : How did Noh become a ceremonial performance for the Edo Shogunate? How did Noh become a ceremonial performance for the Edo Shogunate? Toyotomi Hideyoshi was famous for his love of Noh and Tokugawa Ieyasu was another huge Noh fan. Following the practice of the Muromachi shoguns, Ieyasu started Noh chanting before he joined Hideyoshi's army. During his reign, Hideyoshi had four Noh companies (Kanze, Hōshō, Konparu, and Kongō) under his direct control in Osaka. After Ieyasu conquered the country, he moved them to his own Sunpu territory (currently Shizuoka) and became their patron. His son Hidetada was the patron of the master performer and head actor of the Kongō company, Kita Shichidayū Nagayoshi, who was later allowed to create the Kita school. Hidetada and his son Iemitsu gave their patronage to the Kita school. As many local feudal loads followed their example, the school spread throughout the country. In the samurai society of the early Edo period, the diffusion and the development of Noh acted as a form of diplomacy for feudal lords wanting to be in favour with the shogunate. It was during the reigns of the third and the fourth shoguns, Iemitsu and Ietsuna, that Noh established its role as shikigaku, a ceremonial performance for the shogunate. By this time, Noh actors and their repertories had come to be controlled by the bureaucracy that was governed by officials such as the rōjū (chief of staff for shogun) and waka-doshiyori (statesman of the government). 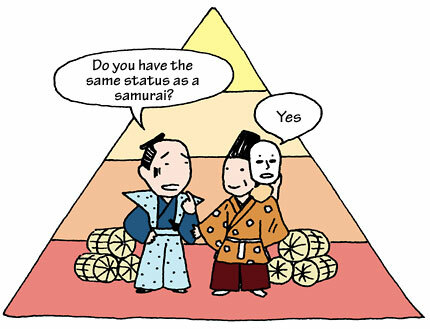 Noh actors were appointed to positions at the same level as those of the samurai and were paid salaries. On the other hand, they became strongly subject to the political power of the shogunate.